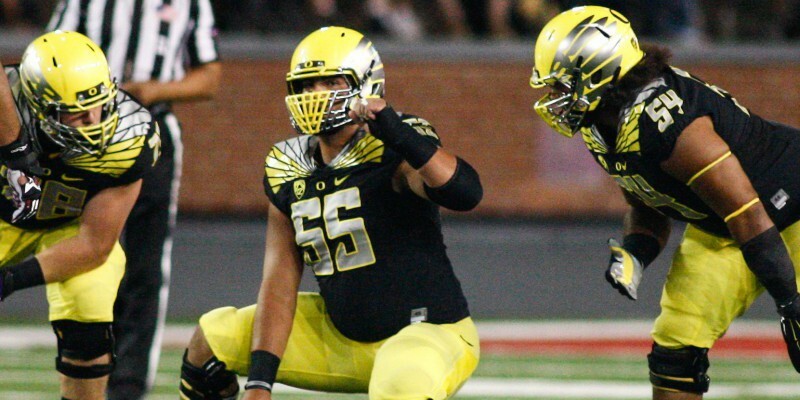 This season has been amazing on so many levels for the Oregon Ducks, but one of the most overlooked aspects of it might be their response to injuries. 1.) Lost starting left tackle Tyler Johnstone before the season began. 2.) 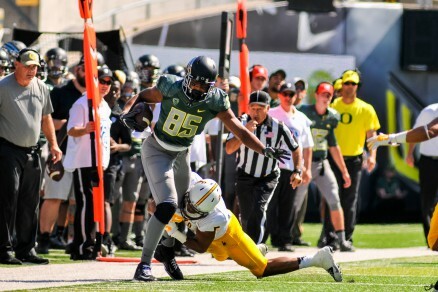 Lost #1 returning WR Bralon Addison before the season began. 3.) Lost starting TE Pharoah Brown for the season during conference play. 4.) Lost starting center Hroniss Grasu for a number of games during conference play. 5.) Lost starting RB Thomas Tyner for over a month during conference play. 6.) Lost starting and elite cornerback Ifo Ekpre-Olomu before the Rose Bowl. 7.) Lost #2 WR Devon Allen on opening kickoff of Rose Bowl. Pharaoh Brown was viewed as one of of the top TE’s in the country before he was injured in the Utah game. There were also a number of other key injuries on the offensive line and injuries particularly early in the season. If you knew these injuries would happen before the season began, would you predict that Oregon would be in the National Championship Game? The Ducks did not just lose players to injuries — but rather they lost STAR players who have been recognized for so many honors and awards that it would take another article to note them! What does this say about Oregon? And where they are now, on the eve of the National Championship Game? 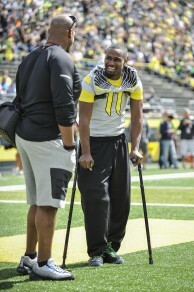 Bralon Addison was considered the #1 returning WR … before getting injured. 1.) Most importantly, it speaks to the TALENT and DEPTH of the team. For all of those names noted, another article could be written with the names of players who took their places and performed exceptionally well. 2.) This in turn speaks volumes about Coach Mark Helfrich and the staff, as to not only their coaching abilities but also recruiting efforts. Many Duck fans may have had concerns about the transition from the “genius” Chip Kelly to the Oregon homegrown Mark Helfrich, as to whether the bar Kelly had set could be maintained let alone improved upon. This season, regardless of the outcome of the National Championship Game, has demonstrated that Helfrich is an elite coach. 3.) The exceptional quarterback we have in Marcus Mariota. Great players make everyone around them better. Oregon has talent and depth at many positions on both sides of the ball and exceptional coaching. However, the offense takes the “conductor”(Mariota) on the field of play to lead the orchestra into performing well. The phrase “next man up” became the mantra under the Chip Kelly era, whenever a player went down with an injury. This season has proven to everyone across the country, and most importantly to the team itself, that the new mantra should be “next winner up.” GO DUCKS!